I'd been putting off asking James Turner to interview with me for more than a year. I've been interested in the Canadian artist since his Nil, a long satirical fable told with meticulously constructed flat set pieces and stock designs, showed up unannounced on my desk at about the same time as I launched this site. 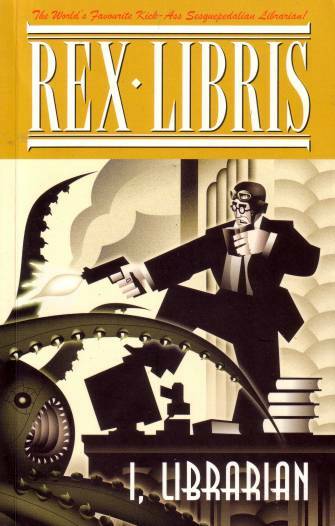 His follow-up series, Rex Libris, another humor comic driven by a simple idea (tough-guy librarian), an appealing line of thematic inquiry (libraries as a repository for human knowledge and achievement), and an attractive mix of shading techniques and angular design, was an interesting departure when certainly more Nil would have satisfied most fans, myself included, and thus that choice became a potentially interesting interview question. My problem was I didn't have a lot of those. While I've always enjoyed Turner's work, I'm not sure that I had any special insight as to what made it tick -- you'll note I whiff below Dave Kingman-style when it comes to suggesting influences. Luckily, by the time I worked up the courage to ask, Turner was interested in doing this short piece and he seemed to be a very nice and forthright guy. I worry that the peculiar, isolated health of the current comics industry may not extend to artists like Turner; if he ends up being a case of someone who's only around for a few years, I hope that you'll learn to enjoy the not-insignificant stack of his comics to date. TOM SPURGEON: James, I hadn't heard of you at all until Nil crashed down onto my desk. I know that you went to illustration school and I believe that you were working a related job until fairly recently. Can you talk about the factors that prompted you to make comics? TURNER: I work as a freelance illustrator, but the dot com bust, coupled with the uncertainty created by the 9/11 attacks, sent the industry into a bit of a tail spin in 2001. Advertising dollars dwindled, magazines closed or went from bible thick to pamphlet size. Things got a little tougher, and I found myself with extra time on my hands. We have to make our own opportunities in the creative field. We are supposed to be creative, after all. I wanted to try and explore narrative, so I did. SPURGEON: I realize it may be kind of hopeless to ask considering how broad the answer could potentially be, but can you describe how you built your initial comics style? There are a lot of individual aspects that I find interesting especially in Nil if you wanted to pull them out that way: the flatness of your worlds, the use of degrees in shading to place characters in the background and foreground, the minimalist character designs. Were you looking at anything that made you think this could work? TURNER: I looked at some of the graphic novels that were coming out, I guess four or five years ago. There was a lot of very diverse material, much of it rendered in a far from realistic manner. That made me think there was a chance for something like Nil. For the most part it was an exercise in adapting my illustration style for the sequential format. I don't have a stock way of rendering people, and I tend to vary shapes, figures, and the like from piece to piece. With Nil I had to standardize. Objects couldn't change or be distorted from frame to frame, or people might interpret the change as a story element. The black and white format led to the outlines; in my illustration work, I don't usually use outlines on objects. I use forms and lines but not lined forms. The black and white format made them seem like a necessity, as there would often be white objects on white backdrops. Outlines were an expedient solution which I've largely done away with now in Rex Libris (with mixed results). The death motifs and the generally dark look evolved out of the material. As the work progressed, it got less expressionistic and more formal and right angled. The figures became less abstract, arms and feet were added, and I tried to be more faithful to the environment and keep it consistent. That hadn't been a high priority when I started. 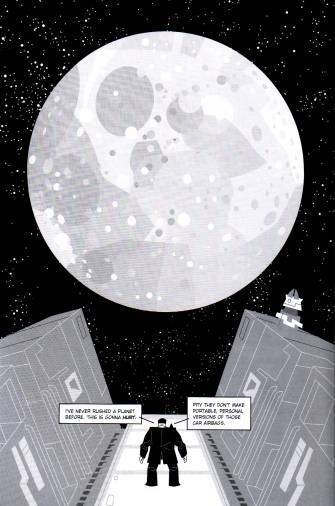 I was more interested in the general ambiance than in continuity. By the end, I was paying close attention to such details. Well. I tried to. I'm sure there are lots of inconsistencies if you go looking for them. The program I use, Adobe Illustrator lends itself to flat environments. So I'm being channeled both by preference and the medium I'm using. I learned as I went, and had to go back and forth and modify and adjust as the visual look matured. It was pretty amorphous at the beginning. 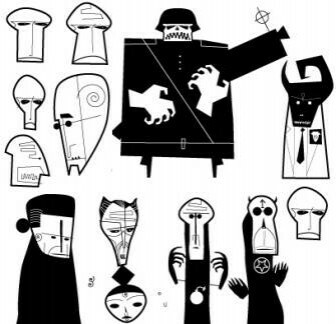 I've attached an image of the first set of digital sketches I did for Nil. SPURGEON: Did you work backwards from your story and create that world or did the world suggest that story? TURNER: The story came first, definitely, and the world flowed out from that. It was a lot of fun to do. Right now I'm having fun designing Hell for my Puk and Muk spinoff book. That's an environment you can really go nuts in. SPURGEON: In answering questions about your work in the past, I found it interesting that despite the precision of your two major works thus far in both cases you cited emotional factors, that you were responding to a sense or a set of feelings in the air. How important is that kind of writing from mood or reacting to an idea important to your process? TURNER: Feeling passionate about an idea or an issue is something that compels me to work. Having something to say is vital. Without that driving imperative, there's not enough energy to get it all done. That's why the children's book I started about seven years ago is still sitting on my hard drive unfinished. I'm just not invested or passionate enough about it to finish the thing. SPURGEON: I can see Jack Kirby in your work, particularly Rex Libris, in the nature of your set pieces, the way you utilize contrasts in size, and the way your figures work on the page. I'm having a harder time seeing Herge; is there anything more specific that is Herge-like in your work beyond that you both have a really controlled sense of place? TURNER: In Nil, I think the attention to environmental detail and the like is a commonality, as you note. In Rex, I tried to look to Herge for the faces (dots for eyes, half-moons for noses). The graphic nature of Rex's jet black suit always makes me think of Captain Haddock. The poses Herge picked were always so filled with movement, and the black ink (with Haddock) gave it a real graphic strength that I hoped to capture with Rex. So there's a kernel of influence buried in there somewhere. I've tried bringing in other influences, but either it's not been noticed or I've aborted the process because it wasn't working (or would have required a major overhaul of everything else). SPURGEON: Are there any influences that might surprise us in your work? Just as an example: I've never heard you mention them, but I could potentially see a bit of Lorenzo Mattotti and/or Richard McGuire in your work, in the way that you use color and the way you place shapes within a central drawing. Who do you read and are inspired by? TURNER: I'm not familiar with either of the gentlemen you mention, but I took a peak at their work on the net, and it's great stuff. I deliberately don't pay much attention to what's going on in the industry, either in comics or illustration. There's good points and bad points in this: I miss out on successful trends, but at the same time I'm less likely to blindly accept the principles the core "herd" is operating by. If I'd really known what was going on in sequential art, Nil and Rex would probably be different, less eccentric. Adhering to convention (and people often do because the conventional usually works) can make it difficult to produce the remarkable. Whether it's remarkably good or remarkably bad is another question entirely. In terms of reading, there are many. On a certain level, I'm inspired by anyone who can complete a novel and get it published. That's an accomplishment in and of itself. Writing a book is a hell of a lot of work. I've written 1.75 of them, both of which should never see the light of day. These days I'm mostly reading non-fiction, so I'm often attracted more by topic than by author. Some who do inspire me are Richard Dawkins, Harold Bloom, Thomas Friedman, Philippe Gigantes, Fareed Zakaria, Christopher Hitchens, David Brin, Jared Diamond, Carl Sagan, Amartya Sen, and Bertrand Russell. They may be right, they may be wrong, but they're always interesting. I am by no means an expert on any. I hope to read more fiction this year. Incidentally, Chester Brown is a very well-read fellow. SPURGEON: I know that you considered self-publishing and had contact with Dave Sim -- he wrote the introduction to this volume. Does self-publishing hold a certain amount of appeal to you? Have professional friendships in comics helped you orient yourself better now that you've entered that field. Since you took a second project there, I assume you're happy with SLG: can you talk about the experience of publishing through them. What is your relationship like? TURNER: Self-publishing holds very little appeal for me now that I know more about the industry and how difficult it is. I'm very happy to have a publisher. I'd only self-publish at this point if I had a project I felt passionate enough about to sink several grand worth into while expecting no return whatsoever. I really like the idea of my comics being printed objects you can hold in your hand, but the lower overhead of internet comics makes that an attractive alternative. I think connections with other comic book artists are most beneficial if you are self-publishing or you are at the core of the industry, and do collaborative work with other artists. On the other hand, both Chester and Dave have given me good advice about the industry. SLG has been awesome. Their publishing slate is diverse, sharp witted, and well worth a look. It's good company to be in. I've seen no reason to look elsewhere. SPURGEON: You have the rare distinction these days of publishing in comic book form these Rex Libris issues before collecting them. Is it important to you that your work is serialized before collection? Does putting work out there that way help you at all creatively, say to make course corrections from something you see or something that's pointed out to you? TURNER: I think I can do more course corrections if it's put out first as a graphic novel. Putting it out issue by issue sets things in place. I wouldn't go back in and restructure/remove/alter major elements in the trade collection, for example. I think readers would feel cheated by that. In fact, I refrained from doing any changes at all in the Rex trade. For some weird reason I had the idea that I should just let it stand with all it's warts as my initial point of "artistic departure," so I, and others, can see how my work evolved (and hopefully improved) as it went on. I must have been on drugs or something. SPURGEON When I've loaned out Rex Libris the reaction I usually get is people prepared to flip through it really quickly based on the art and then this kind of shock settles on their face as they force themselves to slow down and read everything that's there. Some of your pages seem dominated by text. This seems to be a stylistic choice in the manner of your decision to make Rex Libris' figures more representational than those of Nil. That being said, why such dense pages? What effect do you hope to impart with text that's much fuller page to page than with other authors. TURNER: I think Rex has become legendary for being text heavy. If one cannot achieve fame, go for infamy and take kickbacks from ophthalmologists. 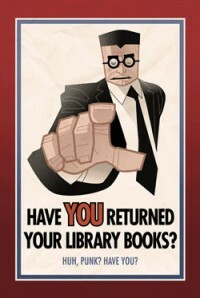 There are two reasons for its text heavy nature: first, it's about a librarian. 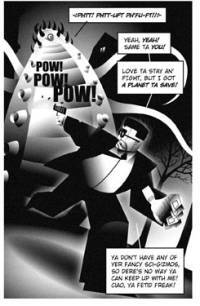 Second, it's a reaction against text-light -- screenplay light, in many cases -- comics. I liked '70s comics with their copious amounts of redundant explanatory text. That's a part of the genre for me. I also wanted something that people could go back to and look at a second or third time and always discover something new. I have no objection to people skimming the text. Comics with little text have little re-read value. That's one reason why I was so fond of Mad Magazine: they threw in all sorts of neat extras, from bogus product info to Sergio Aragones in the margins. You could reread a Mad Magazine a dozen times and always come away with value. I liked that. Great accompaniment for a bowl of late night cereal when you're a kid. You don't get that with the mainstream titles, some of which read like storyboards for movies. I could read one all the way through in five minutes while standing in the comic book store. Not that I'd do that, of course. We all know that would be wrong. You'd need several of these comics to last through a single cup of coffee. Like most revolutionaries I swung the pendulum too far. SPURGEON: Was it hard not to want to do more with Nil considering the complexity of the world created? TURNER: I'd thought about it as a trilogy, actually, and I have an arc for it. I briefly thought about condensing the two sequels into one book, but that wouldn't work quite as neatly as a dialectic, which is how I planned it. Right now I'm having fun creating Hell for the Puk and Muk spin-off. There are lots of cyclopean stone edifices and spikes and chains and such. Hell's a great visual playground. Demons are a lot of fun to design. So many sources of inspiration, and no limitations. 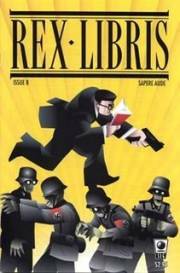 SPURGEON: With Rex Libris it's as easy to see high concept -- tough guy immortal librarian! -- as it is to see the series as a thematic structure regarding knowledge and art and how ideas survive their usefulness. Which one is more important to you in building a story? If neither one, is tension between those kinds of storytelling modes appealing to you? TURNER: That's a really interesting question. I do like the idea of a multi-layered text. I think it enriches the experience if you can engage the reader on multiple levels. It makes it more distinct, and gives it a drive and purpose that might otherwise be lacking. If it was absent, I'm not sure I could turn out anything interesting. 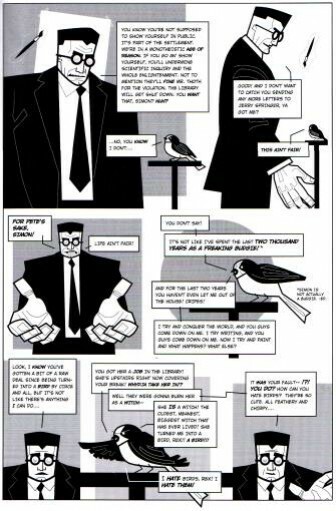 SPURGEON: There's a manic quality to the humor in Rex Libris that you don't really see in a lot of comics: there's also a mix of humor both in terms of the range of complexity in your references and the degree of delicacy in how a joke is constructed. First of all, what or who do you find funny? Second, what do you think working in terms of being funny, or writing comedic material allows you to do that are a more straight-forward satire of exploration of the same ideas might not? TURNER: Tough question. Humour is so subjective. What I find funny can change according to my mood. Stuff I thought was hilarious five years ago I don't like now. One of the reasons I lean towards humour rather than a more dramatic approach is that I think the world is in many ways absurd and ridiculous. That view tends to seep into my work. I think Monty Python and Douglas Adams are influences. The Pythons were well informed fellows, and some of their skits work on multiple levels. Their screenplays are devastatingly funny -- sometimes funnier than the final film. There's depth there as well as absurdity. I think the same goes for Adams. I've always thought Dr. Strangelove hilarious. Some people feel you shouldn't joke about such things, but I tend to think the whole concept of Mutual Assured Destruction is, in a way, ridiculous. Humour to aspire to. SPURGEON: The intricate backgrounds and some of the shading effects -- I assume these are done totally on computer or are assisted by the computer. Can you talk a bit about how you work? How long does it take to do a page? A complete issue? TURNER: It's all done on the computer, bezier point by bezier point. Pretty much the three months to do a complete issue, as I have to fit it in between commercial jobs. Sometimes I get it done a little early, sometimes a little late. The amount of time varies per page depending on the content. I'm not sure exactly how long, but a page a day isn't bad. I will do sketches for more complicated shots, scan those in, and then go over them in illustrator. I may do a bunch of poses/shots at a time, and another day assemble them into the final frames and layouts and add the dialog. It's a combination of cut and paste and drawing. It has advantages and disadvantages, like most things. SPURGEON: What kind of reaction -- and I'm going to assume there has been reaction to both of your SLG works, at least -- has been most gratifying for you to hear? Do you have a sense of who's reading? To what are they responding? 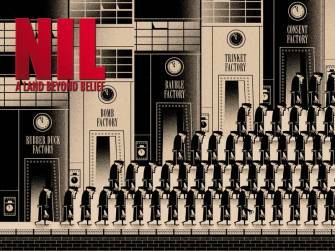 TURNER: I think some of the letters I got about Nil were the most gratifying, especially from the people who really got what I was trying to say, and understood what the graphic novel was really about. Some people didn't think it even had a point. The positive feedback really helps keep you going. Rex has had a more mixed reaction, but there are some people out there who enjoy the humour, and that's enough for me. SPURGEON: Do you plan on continuing to make Rex Libris for a while yet? Returning to Nil? What might we see in 2008? TURNER: The quarterly comic will end with issue #13. It would have ended with issue #10 but I talked to [SLG's] Dan [Vado] and he very generously agreed to keep it going until issue #13 so I can wrap up a story arc. That's a pretty good run for an independent comic. SLG is also interested in doing a second trade which will include issues #6 to #13. After that, I'll probably work on the Hell piece, but I don't know how long that will take or if it will even be published. We'll see what happens. There might even be more Rex material in direct to trade format. 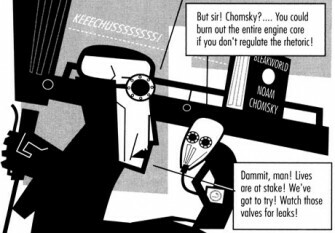 SPURGEON: When you, Dave Sim and Chester Brown have met up, who picked up the check? 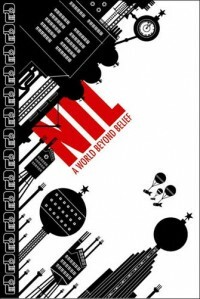 * Nil: A Land Beyond Belief, James Turner, SLG, 232 pages, $12.95.